How do you react when you read/hear the weakness question? With this question, schools are assessing how well you self evaluate. Like a business problem, they want to hear your plan of action, your implementation, and your success rate. 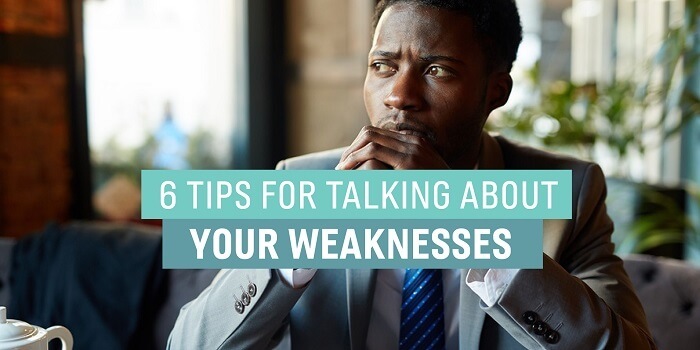 Here are some tips to help you a) think about and evaluate your weaknesses, and b) be prepared to write about them in an essay or discuss them in an interview. 1. Prepare answers in advance. When an interviewer asks, “So Natalie, tell me about your weaknesses and what you did to overcome them?” you don’t want to be left silent drawing a blank, or worse – caught off guard and say something crazy like, “Gosh, there are so many, I don’t even know where to begin.” Ding! If you have been let go from a position, you need to discuss the lessons learned from this negative experience and how you overcame the situation. If you have a procrastination problem, you need to talk about ways in which you’re working on boosting your time management skills. Don’t discuss your addiction to video games or your weakness for chocolate. It’s also certainly not the time to talk about anything inappropriate. We’re talking about work-related, professional weaknesses. 4. Focus on your own weaknesses. Don’t talk about your cousin’s attraction to arson or your mother-in-law’s conspiratorial behavior. Don’t discuss how your boss is a jerk or how you can’t stand your coworker’s habit of nail biting or how your desk is unorganized because the guy you share your cubicle with always throws his garbage your way. This question is about YOU and your weaknesses – don’t shift the attention or blame onto someone else. 5. Proactively address the issues. If you have a quantitative weakness, take courses that address the weakness (accounting, statistics). Don’t wait for the admissions committee to ask you to take a course. If you are uncomfortably shy, getting involved with an organization like Toastmasters can help you and show the committee that you’re taking steps to overcome that challenge. If you need help drafting your essay or framing your answer for your interview, Accepted is here to help you. Contact us for assistance. By Natalie Grinblatt Epstein, former admissions dean/director at three top business schools. Natalie has reviewed over 70,000 applications, interviewed over 2,500 candidates, and has trained nearly 700 admissions directors and alumni volunteers to select outstanding candidates for admission. Her clients gain admission to top programs including Harvard, Stanford, Wharton, MIT, Cornell, Columbia, Berkeley, and NYU. Natalie holds an MBA from Michigan Ross. Want Natalie to help you get Accepted? Click here to get in touch! • How Personal is Too Personal? Last updated on February 4, 2019.